One of the most challenging tasks for cat owners is trying to get your kitty to drop a few pounds. Unfortunately this is also the most common recommendation I make to owners after an annual exam. Essentially all cats do all day, every day is lay around and occasionally get up to eat. This lifestyle makes it very difficult to encourage weight loss. Cat’s bodies were designed to eat multiple small, high protein, high fat meals a day. What the average indoor kitty eats is one to two large meals that are very high in carbohydrates. In addition they do not have to move around or hunt to find their food, we dump it all into a bowl right in front if them. They then devour the food as quickly as possible. This combination of little exercise and high carb diets has led to astounding rates of obesity in cats. The Association for Pet Obesity Prevention estimates that 53% of cats in America are overweight and 19% of these are considered obese. This puts them at increased risk for heart disease, diabetes and degenerative joint disease – all of which are potentially preventable. It may seem the answer is letting your cat head outdoors in an effort to work off some of those calories but I do not recommend this. On average indoor cats live to twelve to fifteen years, the average lifespan of an outdoor cat is two years. There are countless dangers such as cars, chemical toxins, poisonous plants, infectious diseases, and fighting with other cats or wild animals. So, what can you do to help your indoor cat lose weight? My favorite recommendation is to divide their daily food allowance between multiple small bowls and hide these around the house. Your cat then has to spend the day “hunting” for his food. This is mentally stimulating for them as well as encourages physical activity. 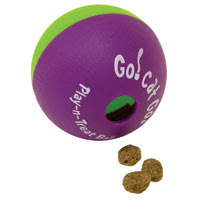 Another thing to try would be a food or treat ball. This contraption is filled with dry food and your cat needs to learn how to manipulate it to get the food to fall out. The other component to weight loss is what you are actually feeding your cat. There are two ways to go with this. The first is a low calorie, high fiber diet that allows you kitty to eat a substantial amount and fill up. The second option is a low carb, high protein and fat diet (Atkins for kitties). In theory these diets should work as they mimic the type of food a cat’s gastrointestinal tract was designed to eat. However, these diets are very high in calories and if you feed your cat too much he can quickly pack on the pounds. Getting your cat to lose weight is a daunting task and it is not easy. I hope some of these suggestions help because a healthy weight is essential to the overall health of your cat.